I participated in this conference by a talk and a workshop. It was a big opportunity to meet people from around the world. 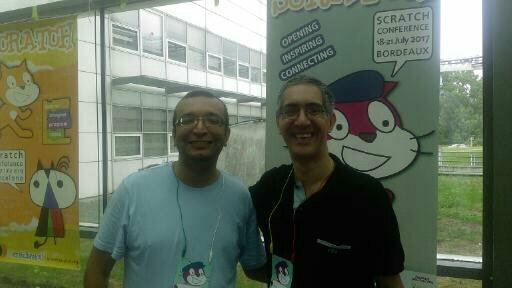 I am a user of Scratch since the end of 2012. I was not only in love with the tool, but also with philosophy behind and the community. Because of this engagement, I know by photos a lot of people of the Scratch community. These people influenced directly or indirectly the path I took during the last years. 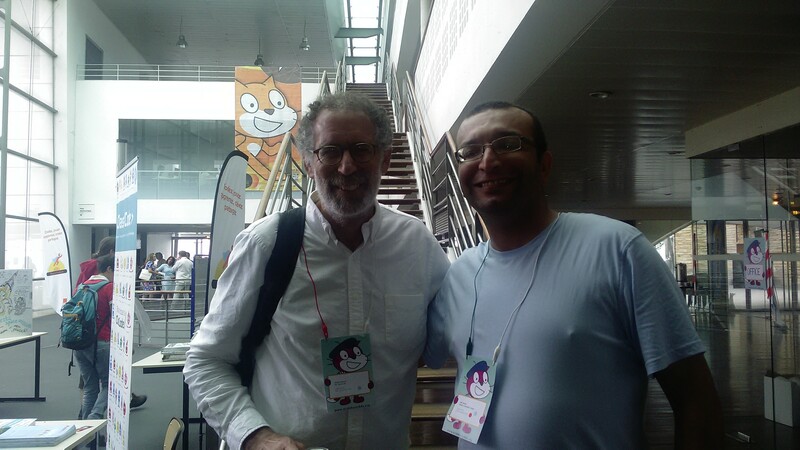 Mitch Resnick: One of most important moments for me was meeting Mitch Resnick in person. I admire him so much. It is crazy to imagine that this person created some thing that changed really the world. Of course, a software like scratch was a result of generations of work but his touch was so big on the tool. I discovered that Scratch is not a unique family, but a big family with big differences with members. Dan Garcia: I was hoping to him in persons and I made it … and I was not disappointed! When I started promoting coding in Tunisia, a lot of people did not know about Scratch at that time. Some of them saw the software like Flash, some other think it is just a nice tool for kids but they don’t see the power behind the blocs programming. The code.org movement made a video with him where he shows his experience teaching programming to students in the university of Berkeley with a software called Snap! One of the sentences I love in the video: We want people to have an exciting and engaging experience with programming … And what he said was not an ordinary sentence but it was really a way of doing that they wanted to implement by the tool snap and by a course that they made called: The beauty and joy of programming. I finally met some friends for real. I know them thanks to the Scratch community and we followed a scratch online MOOC called CCOW. These people influenced me so much. Kim, the Korean is very active in his country and organized several time a Scratch day. I was following his work and it was a motivation to make a Scratch day in Tunisia. Heloeza from Brazil is also active in his country and doing a lot of nice things with kids and with little budget. Their works send a lot of positive energy. Clare is the creator of a huge network of coding clubs called Code Club World. 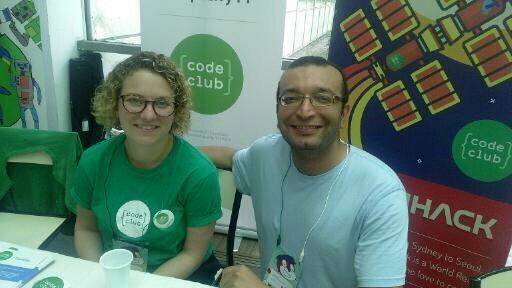 She started her movement before the code.org by connecting teacher in primary school and professionals with programming background. I was following her work since the beginning and translated almost half of the first curriculum into French. At that time, it was the best resources available to teach Scratch. In the last day of the conference, a panel was opened for African participants to show what they were doing. 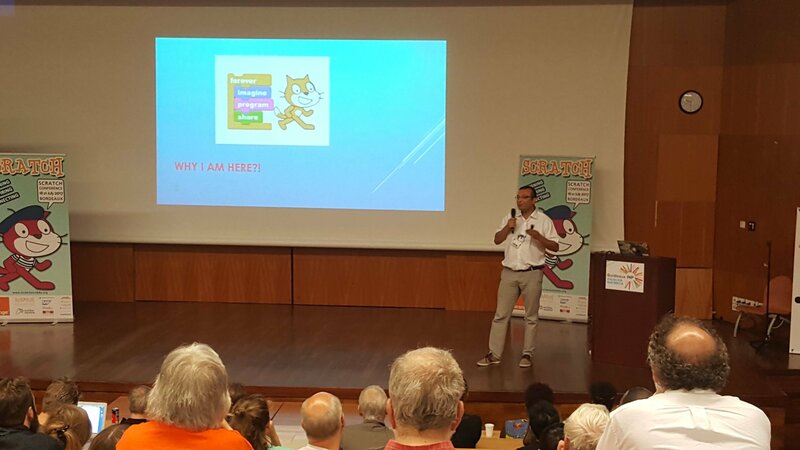 In my presentation, I talked about how the slogan of Scratch Imagine-Program-Share influenced my path and the way I am doing. Photo of Julie Mbaye Yassiban.